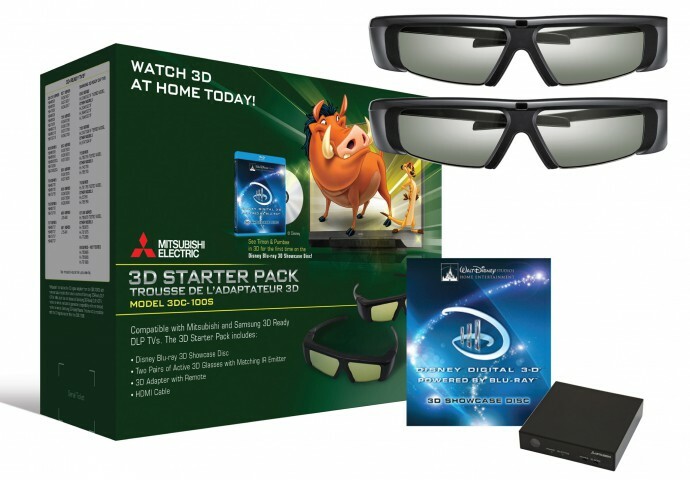 Some time ago Mitsubishi made available their 3DA-1 adapter and 3DC-1000 starter packs to add conversion from HDMI 1.4a format to DLP checkerboard pattern to display stereo 3D content for newer consumer electronic devices on their range of 3D-capable DLP HDTVs. Now Mitsubishi is releasing the new 3DC-100S starter kit that besides Mitsubishi’s 3D DLP TV sets will also work with most if not all of Samsung’s 3D DLP HDTVs. The new 3D starter pack includes 2 pairs of active shutter glasses, infrared emitter for the glasses, Disney Blu-ray 3D showcase disc, 3D conversion adapter with remote control and an HDMI cable. The price for the whole starter pack is $449 USD. Mitsubishi 738 and 838 Series TVs with software version of 012.06 or higher do not require the use of the adapter for HDMI 1.4a mandatory 3D signals as they have the support added in the firmware, if you have older version of the software and a TV ser from these to series you can update your TV’s software for free. Recently Nvidia is making quite a few new products that are not in their main focus and by that I mean the GPU business. Some of the new interesting products coming out from nVidia are for instance the ION platform or the Tegra, products based on which are just now slowly starting to come out in the market. Actually there is one more interesting solution that was announced a few months back, but just recently became available in Europe – GeForce 3D Vision. These are basically LC shutter glasses (often referred as LCD shutter glasses which is not entirely correct) that are designed to work with a suitable display that can provide at least 100 Hz or higher refresh rate. Now as normal LCD displays cannot provide such a high refresh rate or actually we better use the term frame rate here when talking about LCD displays we are going to need a new type of LCD displays. So Samsung and Viewsonic provided a solution in the form of 22-inch LCD displays with 120Hz refresh rate so that they can be bundled with the 3D Vision glasses to provide the best experience. So far ViewSonic VX2265wm is only available on the American market and the Samsung 2233RZ is available in Europe both bundled with nVidia’s 3D glasses or as a standalone monitors. Apart from these two monitors you can also use the GeForce 3D Vision glasses with a normal CRT display (that can provide high enough refresh rate) if you still have one of these lying around. 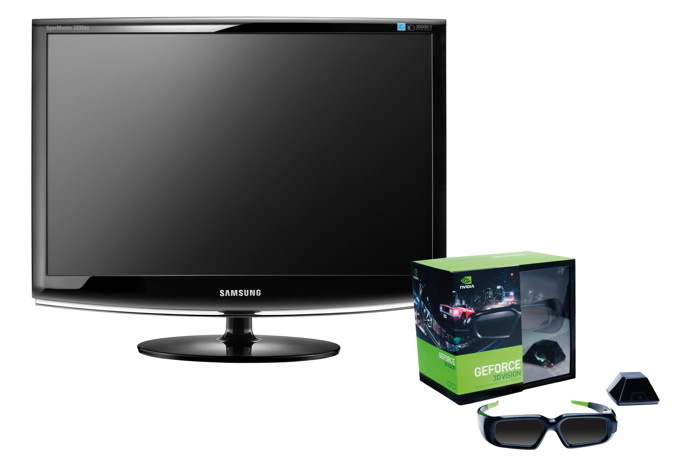 There is also support for some DLP TV sets and 3D projectors, but these are still not very popular and widely available so the best way is just to get the 22-inch Samsung or Viewsonic LCD display available where you live. By the end of this year other LCD display manufacturers should also start to provide suitable models with high refresh rate, bigger resolution and size, but we will have to wait and see.